What books did your kids read during the vacation month? Spud, or maybe another book from the Harry Potter series? Well, it’s sad to admit but for many Zimbabwean schoolchildren the only reading materials are textbooks, a problem that Hello Harare! decided to help tackle. By June 2011, UNICEF successfully completed its distribution of 15 million books to all the estimated 2.6 million primary school students in Zimbabwe. In November, they launched a new donation of books to over 2,000 secondary schools. As Ian Attfield reported on his DFID blog, one speaker at the launch joked that the international donors should be called ‘friends’ or ‘partners’ instead of ‘donors’, which conjured up images of blood transfusions! So, 7 million books should reach every corner of this country in time for the new school year starting in January. This distribution of textbooks will enable the government to achieve its target of one textbook per pupil in six main subjects: Mathematics, English, Science, Geography, History and indigenous languages. The textbook to pupil ratio has stood at 1:10 in most secondary schools, while an estimated 15 % of schools in rural areas have no textbooks at all. Once each pupil gets a set of textbooks, the task of creating a culture of reading should not go off the radar. Many of our parent readers will know that to get their kids interested in reading, learning, and developing the right skills needed for the Zimbabwe of tomorrow, having a home library is an obvious thing to arrange for. But what can you do when you are born in a rural home, where a seven-dollar book can only be dreamt of? This is where we at Hello Harare! decided to step in and do our part. We occasionally have extra copies in our warehouse, and so it seemed only natural to donate those Lira- and Sean Kingston-faced back issues to the Zimbabwe Reads Trust, an organization that makes sure school children of Zimbabwe have something to read besides textbooks. Munn Marketing employee helps Zimbabwe Reads Trust to pick magazines from their warehouse in Harare. We did a pilot project with several schools in the Domboshawa area back in May, and in November we shipped hundreds of Hello Harare!‘s to the Catholic schools in the Archdiocese of Harare, as well as donated several packages of your favorite issues to the Doris Lessing-inspired Africa Book Development Organization, active in Chegutu, Gokwe, Tsholotsho and several other locations in the western part of the country. 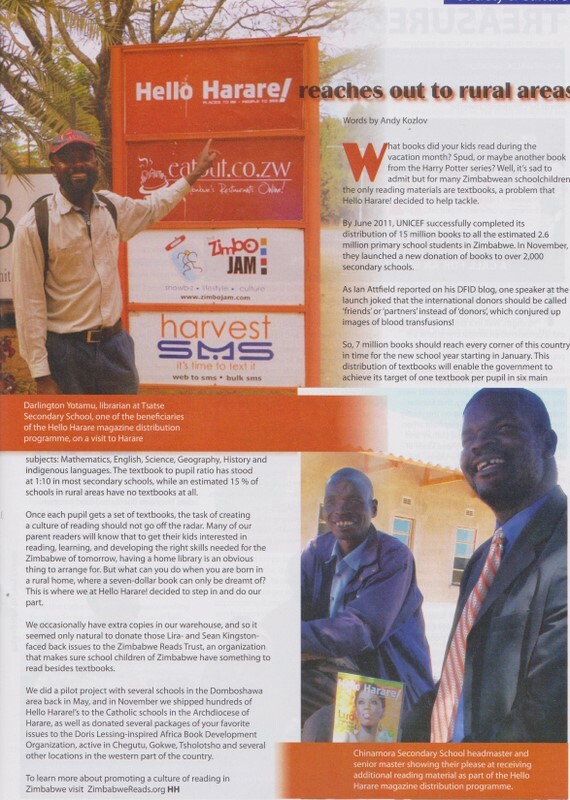 Zimbabwe Reads Trust is also working with a local press distribution company Munn Marketing. Thanks to this partnership, the magazines like National Geographic, Living and Loving and Popular Mechanics reach their young readers in rural Zimbabwe.